I get so busy that I don't have time to get my phone out! haha! while laughing and making perfect mistakes!!! 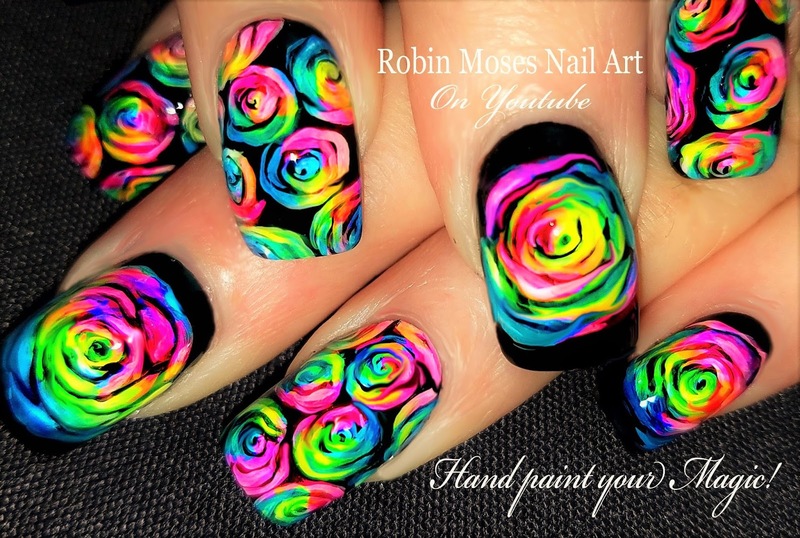 show me on instagram @robinmosesnailart or #nailartsisterhood !!! p.s. Please keep our community friendly and full of joy by always sharing who inspires you. TAG ME: #Inspiredbyrobinmoses everywhere you show your copy of my designs. Happy Memorial Day 2017! Just a quick upload and love from me to everyone learning nail art and having fun! Here is a super easy and fun cherry blossom nail art design done on the most beautiful polish ever given to me by nailartchaholic on instagram! I have the name in the video but If you know the name of what KIND of polish this is ie. unicorn dandruff or fairy glitter, please leave a message for me so I can properly name and tag it!!! LOL! I can't keep up with you guys and the trend titles! *laughing! * Its so reflective and casts shades of fuchsia, pink, blue and teal and is so reflective that I am not sure if I will ever get a great pic of such a beautiful polish color! Thank you to our sisterhood for sharing and giving always. We ARE changing the industry and no matter what, our delight in painting freehand or hand painted nail art cannot be taken from us. This is what I want to teach more than anything. You can lose everything, but they cannot take what you learn and keep with you always! I am and will remain a niche nail art channel dedicated to teaching you how to do hand painted nail art using inexpensive materials and in a REAL life setting. I dont have perfect lighting or music and my voice is in real time. Here, I work in my own salon on my own clients and show you that you CAN earn a living doing nails and sharing what you do online while laughing and making perfect mistakes to take you to the next level in your professional career as a nail tech, as a mom who makes money painting nails, as a sister, friend or professional educator who wants that edge. It is easy to stamp. I love stamps. Stamping is like making posters and freehand nail art is like making paintings. Both deserve credit for making the world a beautiful place full of color and happiness. Nail art allows me to escape and it brings me joy and I want to bring that joy to serious viewers who want to learn. I am not perfect. I do not claim to try and become perfect. I love what I do. I find tons of women who do not love what they do or they spend so much money trying to "keep up" with these trends that just cannot ever make you a decent living in this profession. So, please make yourself comfortable and look around all of my playlists and get a feel of all you can learn and try...practice and patience will get you to your goals! Please subscribe for new videos every monday, wednesday and friday! PLAYLIST full of firework nail art, stars and stripes for the 4th of july nails! Subscribe to my channel here: http://bit.ly/1UDLr1B and Show Me if you try this 4th of July, Party Nails, NYE DIY Easy Fireworks Nail Design with glittery bling Nail Tutorial! Share it on my Nail Art fanpage and instagram linked below so I can see! Twila True: "little black dress" & glitter "sparkling water"
Please SHOUT OUT who inspires you and keep our Nail Art community fun and full of NEW ideas! Hello! And the Nail art for the Day is a beautiful pink glitter french mani with a crazy black line that is both abstract and full of fun and almost impossible to NOT love. You can make mistakes and fix them easily with this design. You can change the color combo and mix and match this effect to create thousands of different look. This design has been in my art toolbox for 2 decades and will never get boring to me. I hope you have as much fun with her as I do, she is one of my favorite designs to do on nails. Have fun painting nail art and show me in the links above on instagram! #nailartsisterhood GET BRUSHES while they last. I will be selling them all weekend at a show but will still be taking orders, but the brushes are growing limited until my next shipment! Have a wonderful weekend and my love to you! Hello! I am a niche nail art channel dedicated to teaching you how to do hand painted nail art using inexpensive materials and in a REAL life setting. I dont have perfect lighting or music and my voice is in real time. Here, I work in my own salon on my own clients and show you that you CAN earn a living doing nails and sharing what you do online while laughing and making perfect mistakes to take you to the next level in your professional career as a nail tech, as a mom who makes money painting nails, as a sister, friend or professional educator who wants that edge that allows them to flourish as an artist and get joy for themselves and for others! watermarble technique and show me! 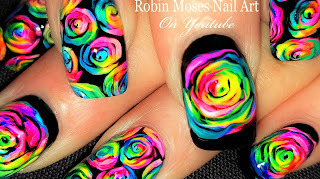 It's my birthday and Mother's Day and I call this AMAZING neon rainbow rose nail design "Robin Moses Roses" LOL!!! I want you guys to have FUN with this tutorial, give the video a thumbs up and share it with awesome women and mothers as a thank you for helping me make this passing year of my life a very healing one after so much sadness. I am so happy! I can breathe again finally!! - Please tell everyone you saw these Moses Roses HERE FIRST!!! -Then, I can find artists who need a mentor and I can help them achieve THEIR dreams! This Moses rainbow rose design could be THE most loved hand painted nail art design of the summer; every nail artist will HAVE to try them, haha!!! !...so, let's do this! 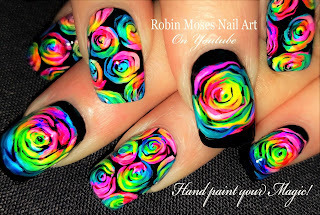 -tag me always #robinmosesnailart when you do!!!. ---I am going to create 4 more like this using different techniques as a thank you for all of the wonderful support I have gotten this last month on my channel. I got scared to show new techniques when so much of my art was stolen and made into plates....but NOW I know you guys love me and will support me on this all the way, always no matter what. :D Its a great feeling to know that and every day I learn and am learning to let go and just relax again! -I will be teaching at my first show in Portland soon and I am so excited to meet some of you FINALLY and begin to share more with you as I might get extra time in my days to make better videos and do extra events. I want to hug everyone who is helping to make this happen. Please know you are loved and I want to travel and meet you guys as much as I can!! -------- NOW LETS PAINT SOME NAILS!!! ----I REMAIN a niche nail art channel dedicated to teaching you how to do hand painted nail art using cheap stuff in a REAL life shop setting. I dont have perfect lighting or music and my voice is in real time, never dubbed. Here, I work in my own salon on my own clients and show you that you CAN earn a living doing nails while laughing and making perfect mistakes to take you to the next level in your professional career as a nail tech or as a mom who makes money just painting art on natural nails, as a sister, friend or professional educator who wants that edge in having as much info in her basket as possible!!!! A huge thank you to every woman, mother, sister and girlfriend I have in my life. Happy Mother's Day and HAVE A WONDERFUL WEEKEND!!! p.s. Please keep our community friendly and moving forward with joy by always sharing the name of who inspires you. The Most Amazing White Flower Nails that You Won't take off! Subscribe to my channel here: http://bit.ly/1UDLr1B Please Forward to 7:54 of this video to see a better picture of the end result! Prom Nail Art | Tons of designs for nails going to Prom! Full tutorials and a design that will be perfect!